The linking verb “could have” is the rear view mirror of the predicate world. Ordinarily it signals regret and works as antacid, a crutch, a wound-licker for all who didn’t finish first, who had bad luck, bad timing or bad judgment, for the Mama Roses and Anthony Weiners, the Wally Pipps and the Zola Budds, the understudy to the star who never twisted her ankle, the quarterback who did, the dreamer with a one-way ticket to Palookaville muttering down on the waterfront about being a contender. 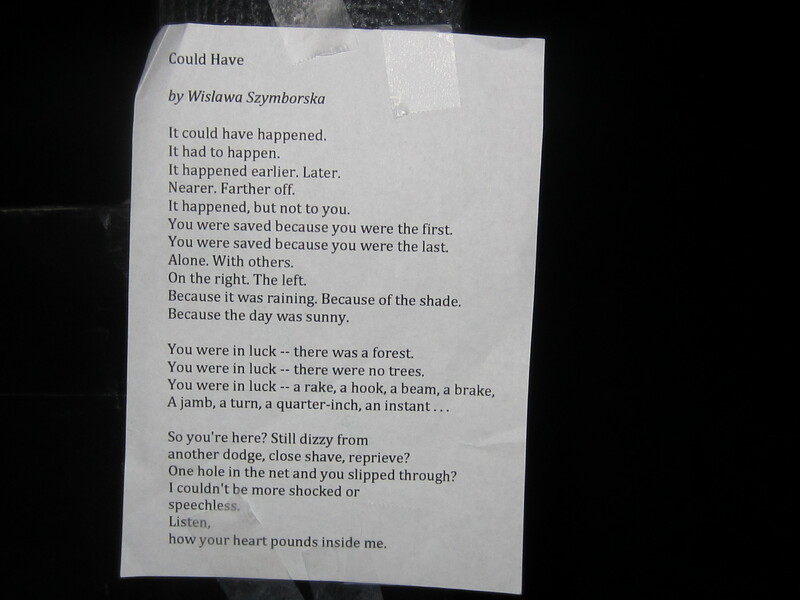 But in Wislawa Szymborska’s “Could Have,” could have expresses the opposite of regret. Ostensibly the poem expresses relief that the bad thing that could have happened didn’t. The poem begins with a breathless response to some disaster, as if the speaker is processing as we listen. The speaker uses every trick of punctuation and rhetoric to make sense of senseless tragedy: dashes, ellipsis, sentence fragments, questions, parallel structure. She creates a list of the situations and artifacts that separate survivor from victim. But as the list develops, contradicting itself and throwing out smaller and smaller reasons for survival until it ends with a quarter-inch and an instant, relief becomes terror. There are no foolproof rules to follow that will detour disaster. Shade/sunny, left/right, forest/no trees—no place and no circumstance are fully protected, and no person is either. Recently my sister was talking to a man about her worries that her son going to college would be safe. Years before this same man had lost his college-age son in a house fire. His counsel to my sister was not reassuring. “Listen,” he said to her, “it’s all luck.” Fate is fickle and those who pray and those who don’t, those who wear helmets to roller skate and those who throw footballs on ski hills, those who run marathons and those who sit on couches, all are vulnerable to disaster. Finally the speaker gives up on the list and addresses the survivor with a series of playful questions. You think it couldn’t happen to you? she seems to say. Because it could have. I have my own list of could have’s in regard to “Could Have.” Where else could I have left the poem? Driving around, looking for an appropriate spot, I started with the idea of a body shop. I didn’t think that would be too unkind, given that a person with a car that can still be repaired was probably not killed in the damage. But then I drove by an insurance agency and decided that the door to the agency would be less in-your-face. A poem about risk assessment for a company that does the same. Perfect. But I didn’t slow down in time and soon I was headed for a country club. Country clubs are protected spaces that offer security from trespassers and other agents of harm including denim and poverty. I got as far as the sign that pointed guests in one direction and deliveries in the other before I turned around, unable to decide which one I was and sure that I was being watched. I settled on this fortress of a house under construction. The difference in the lighting between the two pictures happened because I posted the poem at night (I should re-name myself Poem Chicken), but didn’t get a clear picture of the whole deal, so I had to go back during daylight hours. The poem was still there, but only for that morning. Everytime I’ve driven past this house I think, Who builds something like that? What is the motivation besides displaying wealth? 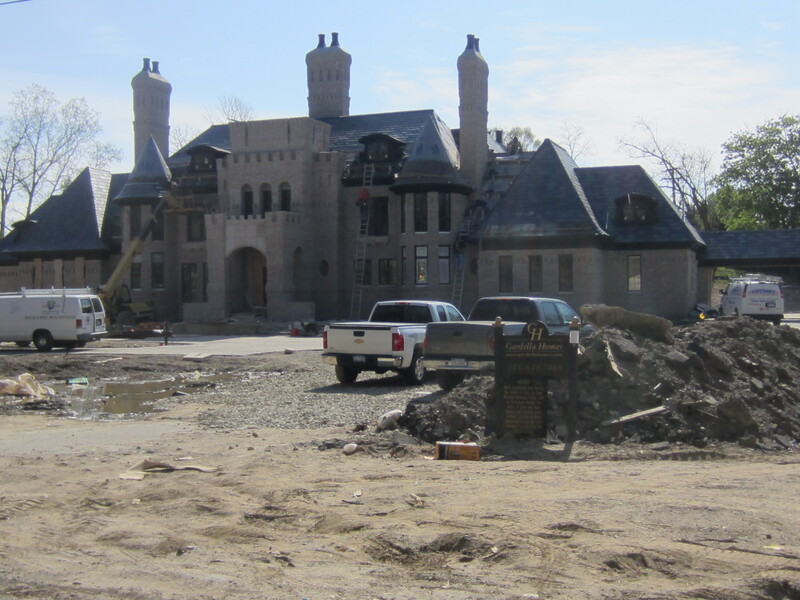 My answer is the same as my assessment of country clubs: people who build castles want to keep things out. Great wealth allows people to separate themselves from tedious chores and hassles, and allows the illusion that harm and pain can be distanced as well. No one needs this poem to puncture holes in that idea—the deaths of Princess Diana and Brooke Astor are common knowledge—but I left the poem here as more than a finger-wagging at the rich. “Could Have” connects the construction workers in their hardhats to the builders in their offices to the future owners to the drivers who gawk at the excess. It could happen to any of us and so It happens to all of us. 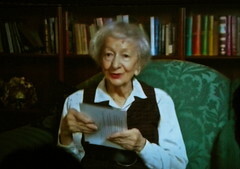 Wislawa Szymborska was born in 1923 in Poland and just died this past February at age 88. Early in her career she was a communist intellectual but later grew disillusioned and became active in the Solidarity movement. She had a modest career as a reviewer at a literary magazine and a poet popular in Poland but unknown elsewhere until she was the surprise winner of the Nobel Prize in 1996. There is also another motivation: Curiosity. I am curious about people, their feelings, what they live through, their fate, what this life means. So this wonderment, curiosity and sadness, all of that comes together for me. I always enjoy the poems selected but I must admit that the most quotable bits of your posts often come from your own musings – your comment about the clubs offering security from trespassers and other agents of harm like denim and poverty – is classic. I have spent a fair bit of time in those settings always with a mix of enjoyment and guilt. I often think way too much about the meaning of it all to truly enjoy the surroundings! We actually drove past the house in your post the other day and said to my husband, “Nobody needs that much space – come on!” Ah but one could judge our comforts as well……. Thought provoking! “Ah but one could judge our comforts as well”—-true, true!